Starting August 17th, signed prints of the photograph above are available (at $100 plus shipping) in Gerd Ludwig’s first Instagram flash sale. 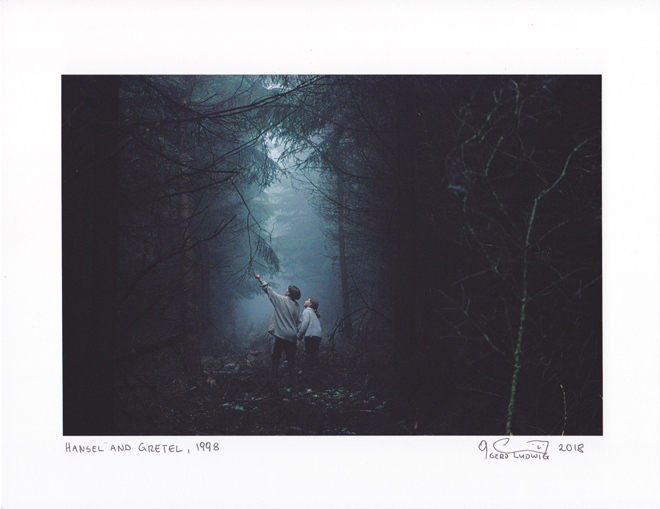 This image of two children walking down a narrow isle in the dark German woods during a field trip was featured in National Geographic Magazine in 1999 in a story about the Grimm Brothers’ Fairy Tales. In early 1800s brothers Jacob and Wilhelm Grimm published a book of tales, largely gathered from storytellers in central Germany. It remains unrivaled to this day, containing such indelible tales as Sleeping Beauty, Little Red Riding Hood, Snow White, Hansel and Gretel, and Cinderella. Echoes of the world-famous tales still resound in my native, rural Germany, from brooding castles to deep, dark forests. For this flash sale the photograph is printed on an archival 8.5×11 inch Legacy Platine paper with an actual image size of 6×9 inch. It is signed with an archival marker on the front border. Expensive large edition prints of this photograph are in private collections. The flash sale ends on September 7th. All prints in the US are shipped via USPS priority mail. To outside of the US prints will be shipped at low cost from Germany, and may take up to two weeks after the flash sale ends to reach destinations outside of Europe. You can order a print by going to my Instagram @gerdludwig and follow the link in the bio or you can purchase one here.